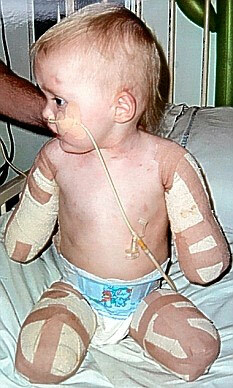 When Pistorius was just 11 months old doctors found that he had no fibula in both his legs. He was amputated below the knees. Pistorius, now aged 25, is a world record holding sprinter. 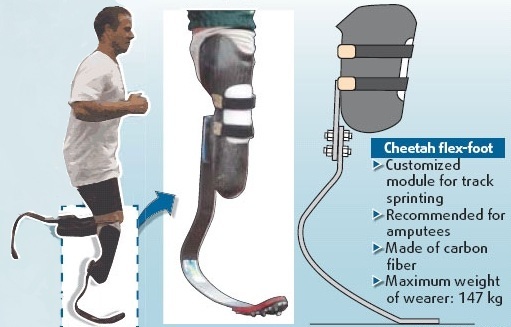 He runs with the aid of Cheetah Flex-Foot carbon fibre transtibial artificial limbs made by Össur, Reykjavík, Iceland. He competes in T44 (single below knee amputees) events though he is actually classified in T43 (double below knee amputee). He is the world record holder for T44 in the 100, 200 and 400 metres events. The IAAF claimed that the amendment was not specifically aimed at Pistorius. However, on January 14, 2008 the IAAF ruled him ineligible for competitions conducted under its rules. That included the 2008 Summer Olympics. Pistorius sought the help of sports lawyer Jeffrey L. Kessler, who has represented the NFL and NBA Players Associations. On May 16, 2008 the ruling of the IAAF was reversed by the Tribunal Arbitral du Sport. The Court ruled that overall there was no evidence to show that Pistorius had any net advantage over able-bodied athletes. 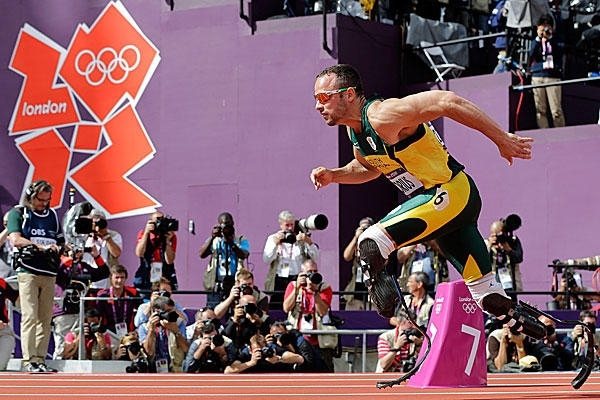 Pistorius was given back his right to compete in the Olympics. Although eligible to compete in the 2008 Summer Olympic Games in Beijing, he did not qualify for the South African team. On 16 July 2008 he achieved third place and a personal best time of 46.25 seconds in the 400 metres in Lucerne, Switzerland. But this was short of the Olympic qualification time of 45.55 seconds. And for the 4 x 400 metres relay there were four other runners who achieved better timing. At the 2008 Summer Paralympics, he won gold medals in the 100, 200 and 400 metres (T44) sprints. He is now representing his country at the London 2012 Olympics. A few months ago, Oscar ‘Blade Runner’ Pistorius met the chirpy 8-year-old Ellie May Challis. Ellie May Challis was born in Essex, England in 2004. When she was just 16 months old, she was struck down with a near fatal case of meningitis. She survived; but the effect of the deadly septicemia bacteria was so severe that both her arms and legs had to be amputated. 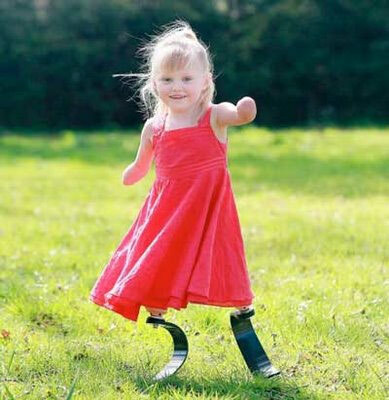 Ellie was originally fitted with standard prosthetic legs. She found it difficult keeping up with her siblings (twin sister, Sophie and older siblings Tai-la,9 and Connor, 11) and other children her age. Ellie’s community loved the little girl. They raised enough money for new carbon fiber prosthetic legs, same as those used by Paralympic sprinters. This makes Ellie the youngest person ever to have carbon fiber prosthetic legs. On the first day to her school, Ellie walked on her own in her new carbon fiber prosthetic legs. There are several advantages of using carbon fiber over fiberglass or Kevlar. Carbon fiber is extremely strong. It is much more lightweight and could be turned into very thin sheets. A major disadvantage, however, is that carbon fiber, when bent to a great extent, can break. Ellie loves her new limbs. Within seconds of having them on, she was off. They will have to be replaced every two years as she continues to grow. When Oscar Pistorius and Ellie May met, knowing that both have been fitted with prosthetic limbs, they decided to challenge each other to a few races. Pistorius seemed to have underestimated Ellie. Just mere weeks after learning to walk with her new carbon fiber prosthetic legs, Ellie was able to beat Pistorius in all four of their 15-meter races!